Introducing the IAQ Guard professional service program from Building Sciences at Pure Air Control Services, Inc.
Indoor air quality remote monitoring is poised to become an industry standard in the coming years. The conventional methods to monitor baseline IAQ involve being onsite to conduct a variety of tests. Typically, building scientists and industrial hygienists are called for testing when indoor air quality conditions degrade to the point of affecting building occupants. But what if a facility manager or industrial hygienist could view real time environmental data to respond more quickly to potential issues? Now you can with IAQ Guard! IAQ Guard is a 24/7 indoor air quality remote monitoring program. It consists of a series of remote sensors that are placed throughout different zones in the building envelope. The sensors connect via the local WIFI network to a gateway node which in-turn connects to the building’s router for internet service. The gateway aggregates data from the sensors then uploads it to an easy to read IAQ Guard remote dashboard. A unique dashboard is created for each building signed up for the service program. Building Sciences team members, as well as facility staff can access the dashboard view IAQ stats. The technicians from Building Sciences will evaluate the building in need of monitoring to the ensure optimal number and placement of the sensors. Then all of the sensors, the gateway and corresponding connectivity is installed. 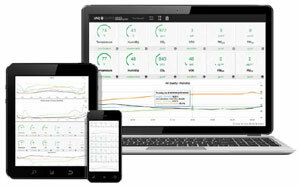 Finally, the account and dashboard are setup so that the IAQ Guard indoor air quality remote monitoring can begin. Over time data is logged and trends begin to emerge that illustrate a baseline of the buildings use. For example, Carbon Dioxide will likely rise when the space is occupied and decline after work hours. Once the baseline is established alerts can be setup to trigger should parameters become elevated over an extended period of time. This would then queue a response call from Pure Air Control Services to notify facility management about the concern. If it appears an issue is beginning to manifest a technician from Building Sciences will be dispatched to the site for a forensic investigation. A detailed report will be supplied outline the conditions and any recommendations for remediation. What data does it monitor? IAQ Guard can be setup for other specific assays for an additional cost. These can include Carbon Monoxide (CO), Formaldehyde (HCHO), Hydrogen Sulfide (H₂S), Nitrogen Dioxide (NO₂), Ozone (O₃) and Sulfur Dioxide (SO₂). Since IAQ provides indoor air quality remote monitoring in real-time there are other beneficial uses for the program beyond preventative maintenance. IAQ Guard’s reporting and record keeping can help ensure compliance for organization programs like ASHRAE, LEED, OSHA, or WELL. It can track changes in building performance and send alerts for corrective action. IAQ Guard can also reduce project liability exposure for damage to sensitive critical infrastructure. So much emphasis is being placed on both the energy and people costs in facility operations. IAQ Guard is the ideal program to supplement energy efficiency and occupant well-being initiatives. 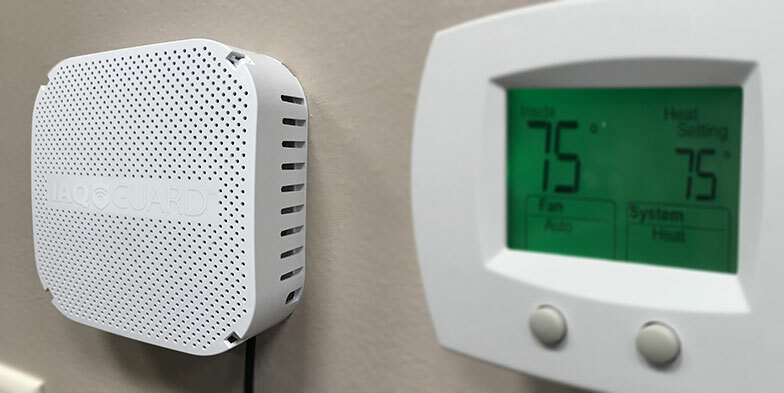 Real-time indoor air quality remote monitoring isn’t just the wave of the future, it’s here now with Pure Air Control Services IAQ Guard program. For more information on IAQ Guard or to request your complimentary consultation please call us 1-800-422-7873 or contact us via this website.